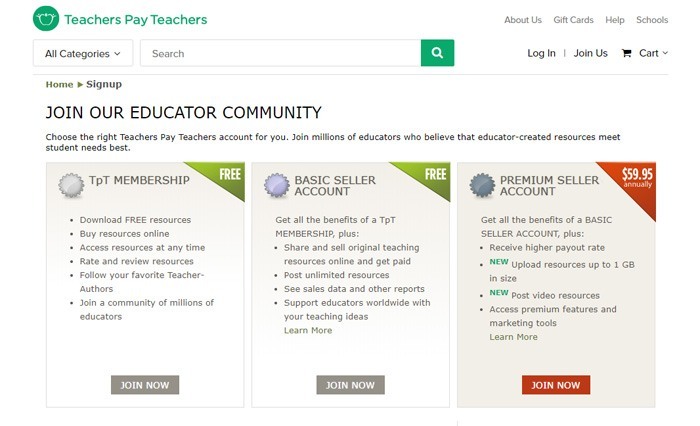 Can You Really Make Money On TeachersPayTeachers.com? This is a very unique website that I came across while researching some new and different ways to earn money online. But can you really make money on TeachersPayTeachers.com? They claim to offer teaching resources to teachers in almost any different field. In fact, they provide access to over 3 million different resources. Some of these are free, but many of them cost a little bit to purchase. But where I got interested in this site was the part where teachers can upload and sell their own resources. Yes, as it turns out, many teachers use TeachersPayTeachers.com as an online medium to sell their own classroom lessons—and it seems as though they make some pretty decent money at it as well! The site sells resources for almost any subject you can think of. In fact, they offer shoppers the ability to filter products not only by subject, but also by price, resource type, CCSS, and Grades as well. As far as I could tell, they offer materials for grades ranging from PreK, all the way past 12th grade into higher education. They even offer resources for staff and homeschoolers. The landing page offers a number of different directions to go in. You can log in, join the site, click on one of the menu tab options, or start browsing resources right away. I clicked on the ‘About Us’ tab, and learned quite a bit about the website here. 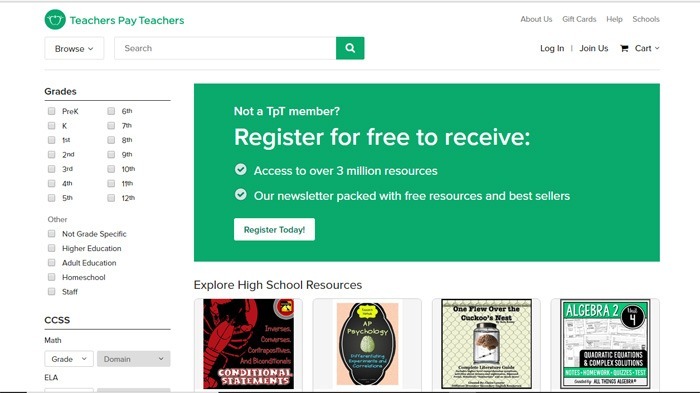 TpT (the acronym that the site uses for itself) is said to be the ‘go-to place for educators to find the resources, knowledge, and inspiration they need to teach at their best.’ They also say that they offer more than 3 million paid resources, and that these resources were created by educators who understand what will actually work in the classroom. As a general rule, I really like things like this. I am not a teacher—but I have a hard time believing that anyone would know what would work in a classroom better than a teacher. So to put together a website like this, where teachers could keep from being forced to ‘reinvent the wheel’ as they come up with lesson plans, is pretty awesome. Plus, many of the lesson plans and resources offered on this site seem to be pretty affordable. I didn’t see very many that were priced at over $5… so in the grand scheme of things, this is also a pretty affordable place to get them. But I wanted to know a little bit more… so I took a look at some of the featured lesson plans located on the landing page. Ok, do you remember how I said that the lesson plans seemed really affordable, and that most of them seemed to be priced below $5? Well, once I started looking around, I realized that there was a lot more variety than this. I saw lesson bundles priced at almost $100… but then again, I saw plenty of individual lessons priced at $2. So yeah, the prices really vary here. But with that being said, I certainly didn’t feel like anything was overpriced. When you compare these prices to the kinds of prices you would find in a bookstore, these are obviously more affordable (which is kind of a no-brainer, seeing as how they are digital downloads). I saw that every product also comes with a rating that tells you how well-received it was by other teachers. There is also a review system where you can leave reviews of products you have purchased. Of course, you can also read what other people have said about any product by reading through its reviews as well. It seemed as though most of these products were offered as a PDF file, which was pretty awesome. They also tell you how many pages are in the unit, as well as what size the file is. And for most resources, there are also sample pictures of what the printouts will look like. Some of these resources have been purchased by a lot of different people! One of the lessons that I looked at had been downloaded almost 2,000 times. And when you take into account that it has been priced at $3, you start to realize that this could actually be a pretty lucrative idea. But how do you get into it? Who can sell stuff on TeachersPayTeachers.com? As you can see, there are three options for joining the site. Two of them are free, and one of them comes with a $60 annual price tag. Membership is free, and basically allows you to download free resources and buy resources on the site without a problem. There is also a ‘Basic Seller Account,’ that seems designed to get you started selling stuff on TeachersPayTeachers.com. Then, there is the ‘Premium Seller Account’ that makes it even easier to sell things. If you pay for this account, you get all of the benefits of the basic seller account, plus a few extras. Support educators worldwide with your teaching ideas, etc. So yeah, this was all pretty cool. But I was, at this moment, a lot more interested in the Basic package than the Premium. I wasn’t completely sure that I would even be able to upload any teaching resources, seeing as how I was not technically a teacher. I found myself wondering if you needed a degree to make money on a site like this. So I gave it a try, and was pleasantly surprised. I was actually still able to sign up, despite not being a teacher. There was a spot where they ask you what grade you teach, but you can also answer that you are ‘not a teacher,’ and simply list yourself as a parent, an ‘other’ type of educator, an administrator, etc. So I was happy to see this. I also found that the selling part of the site was pretty intuitive and easy to use. A brief walkthrough helped me to understand the basics, and I found that uploading products would be a pretty easy process. Here is a screen shot of the seller dashboard. I was happy with how all of this was looking. I also did some reading up on the process in the FAQ section, where they host a very informative section on selling. They clearly list all of the guidelines, and I was actually quite relieved to hear that, thus far, there would be nothing to keep me from making and publishing my own course materials! Of course, the entire point behind this site is that it is supposed to be a place for resources created by teachers for teachers… and since I am not a teacher, I feel as though I would not be able to fully grasp exactly what is needed in a classroom setting. But… for people who do have the knowledge to approach a project like this, TpT could actually provide a pretty awesome opportunity. Personally, I really liked this website—and I am actually surprised that I’ve never heard of it before. True, it really is best suited to teachers who want to make some extra money by providing resources to other teachers—but I still feel like it could be an awesome business opportunity all on its own for someone who has the knowledge! It takes quite a bit of effort to put lesson plans together. So it’s really cool that this website offers resources like this, not only to provide a way for educators to earn some extra cash—but also as a means for teachers to gain access to more types of material. And since they are all digital downloads, that keeps it affordable while still making it worthwhile. I am not sure that you would really be able to make the best use of this site if you don’t have any teaching experience—as it may be difficult to know what you need to do as far as actually putting lesson plans together. But… all things considered, I really liked TpT, and plan to look into it a bit more to see if I could potentially earn some side-hustle cash with it. If you publish a few things on it, market them, and sell them, then it could quickly make itself worth the time. It would just take some effort to get things going. And of course, you would never be guaranteed to make any money. But then again, the best jobs often come with at least a certain amount of risk. Should you use the website and try to make some extra money selling teaching materials? There are a lot of ways to make money online. Some are good, some not, but ALL of them are still just trading hours for dollars. Starting your own affiliate website really is the holy grail of "making money while you sleep" and earning income from anywhere in the world. Your website is online 24/7/365 and can be accessed from any computer or smartphone. Running a successful affiliate site isn't easy, but it's a little easier with the help and step by step lessons from this program.